I was walking to my class yesterday at noon when I got a notification from my ScoreMobile app … “Marcus Mariota declares for NFL draft.” Now, I wasn’t naive enough to think that Mariota was sticking around for another year, but I had this underlying hope that he wouldn’t leave. As a sports reporter I would have been somewhat upset if Mariota chose to stay. 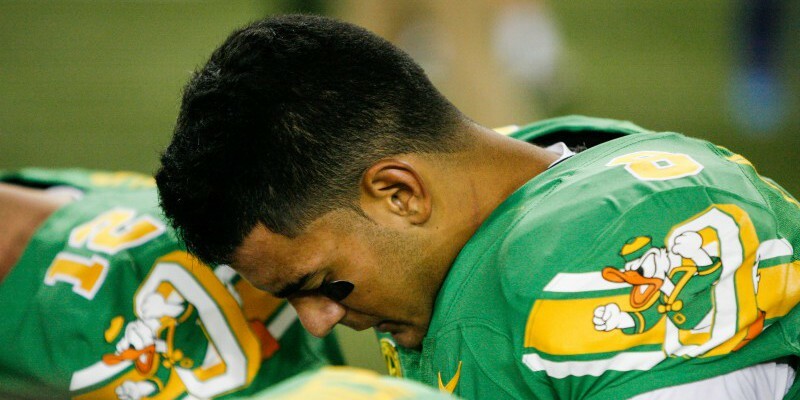 Marcus Mariota in his last game as an Oregon Duck. Won the Heisman and officially validated that he is the best quarterback in the nation. Named AP Player of the year. Won the Maxwell and Walter Camp awards. Was named the Pac-12 offensive player of the year. Set a conference record for most touchdowns in a single season with 58 (42 via pass, 15 on the run and a touchdown catch). Set a Pac-12 season record for touchdown passes thrown in a single-season. Set the conferences career touchdown record with 136. In every single he played in his career at Oregon he started he threw at least one touchdown pass per game (41 games). He is one of only four players in FBS history to have thrown for more than 10,000 yards and run for more than 2,000 in his career. Marcus Mariota in the Stanford game earlier in the season. As sad as it may be, it’s time to let our young man take the next big step in his life and career. But if one thing’s for sure, Mariota will be greatly missed. I would even dare say that he will be one of those beloved, adored and talented players in college football history. Now, I am a Broncos fan until I die, but wherever Mariota ends up in the NFL, I’ll be rooting for him. Once a Mariota fan, always a Mariota fan. Mahalo, Marcus.